In Japan, I have had several "first experiences." One particular experience, thanks to the kind invitation by the Rikuryo Webb Club, was my excursion last November to Takamatsu in Shikoku along with several "genki" Rikuryo members. The prime event of that outing was to feast on oysters, a seafood that I, for some reason, have never tasted. We arrived at a restaurant that was located right near the sea harbor, thus, the meal of freshly caught oysters. 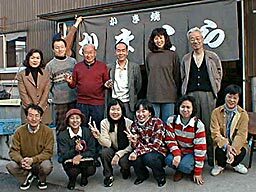 Once all of us were seated around the heated table, an "ogata konro," piles and piles of oysters were scooped on top of the "konro" to cook. And when the oysters were ready, we were ready to eat! And so we ate to our heart's content because the oysters were so tasty! 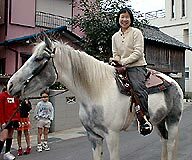 After our delicious meal, the kind restaurant owner offered his customers a chance to ride his horse around the block. Another "first experience" for me! That day I spent in Shikoku with Rikuryo members proved to me, once again, of the endearing Japanese hospitality. copyright © 1997-2012 六稜web all right reserved.